Politically, Wisconsin is quite different from my home state of New York. It’s long been considered a purple, or swing, state. For that reason, Wisconsin has often received extra national attention when it comes to local or state-wide politics. The 2018 Midterm Elections were another example of this, with many citizens around the country tracking Governor Scott Walker’s race against Superintendent Tony Evers. Today, I explore how Twitter talked about this race in the week leading up to Election night (October 28 to Nov 7). This post will focus on the lead-up to the election. Part II will focus on the last few hours of the election (12:30 to 2:30 on November 7, 2018). In the week leading up to the election, there were several noteworthy spikes. We focus on two in particular: November 1 (8-9pm) and November 4 (7pm). 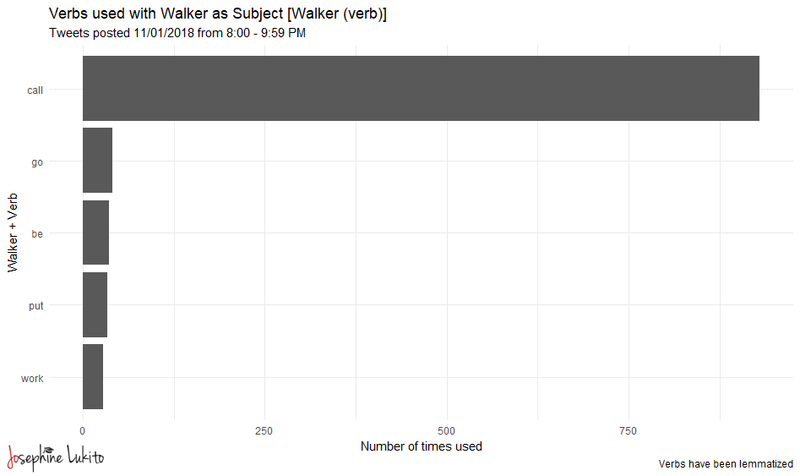 This was the largest spike for Walker in this week (1568 tweets in two hours). Far and away, the most common verb used was variants of “call” (e.g., “called”/”calls”/”calling”). This is because, that day, Governor Walker said that President Obama was "the biggest liar of the world.” This language (employed by non-journalists and journalists alike) was also employed in leads of news stories in Fox News and The Hill). 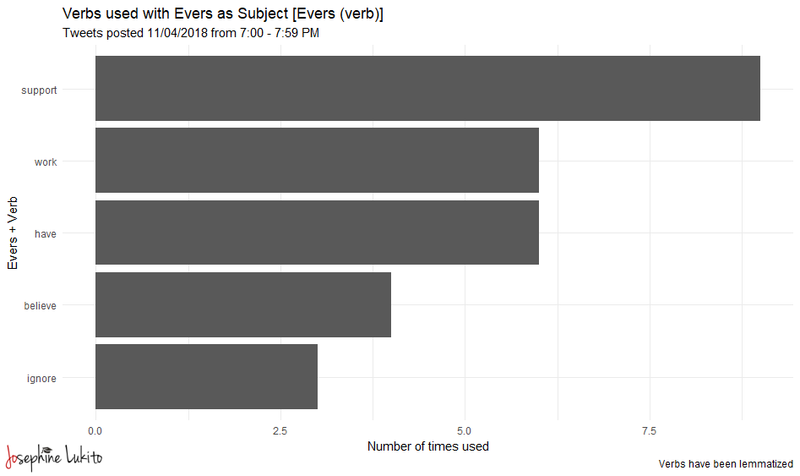 Although this peak was not as prominent as the others explored here, it is one of the few times that Evers exceeded Walker in references on Twitter. Many of these tweets appeared to be campaign-oriented tweets about Evers’ support for Wisconsin residents. Unlike the previous spike, there did not seem to be an event aligned with this moment in time. This suggests that this spike was campaign-induced, rather than naturally generated. 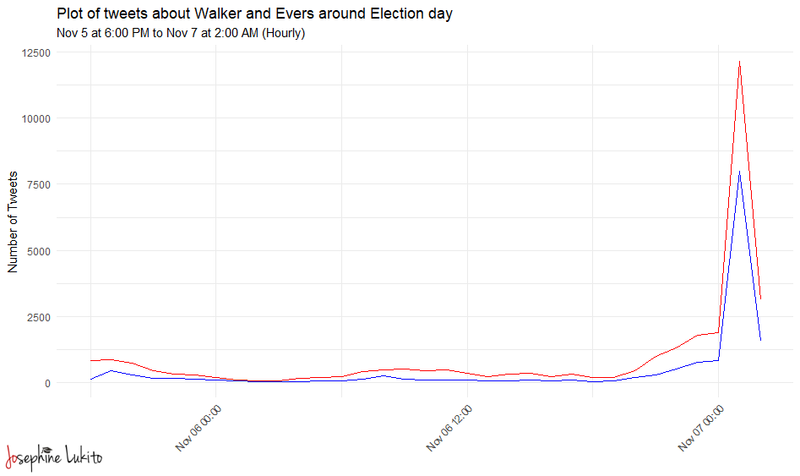 As can be seen in the above image, attention to the Walker/Evers election peaked after 12:00 AM CST, late in the night relative to other well-watched races that day. Votes rolled in minute by minute, with many outlets (including NYT, one of my main trackers) showing a less than 1% margin for several hours. Tweets were collected using Mike Kearney’s rtweets. I began my search at 2:40 AM CST on November 7, 2018, using the search terms “Scott Walker” OR “Tony Evers” OR “#wipolitics” OR “#wielection“. Twitter’s REST API provides an about 1% random sample of tweets. This yielded about 111,000 tweets. Tweets were annotated for their part-of-speech and dependency using coreNLP. Within the corpus, there were over three million dependencies.